Opening Day Generals shortstop Brad Miller was named AL Player of the Week Monday. GENERALS RECAP: the Generals and Mississippi Braves were rained out for the second consecutive day on Monday. The Generals took 2 of 3 in the series, but fell on Saturday night in 11 innings, 7-5. The 2 games will be made up as part of doubleheaders in Pearl, MS on August 8th and 10th. NEWS & NOTES: 36 of first 93 games have been 1-run games (14-22) which is the 5th in all of minors…51 of 93 games have been decided by 2-or-fewer runs (18-33) and 12 have been extra-inning games (4-8)…In games decided by 3+ runs the Generals are 23-18. • ALUMNI REPORT: 2012 General catcher Mike Zunino was 2×3,R,HR,RBI and hit his 2nd homer of the year and first at Safeco Field in the Mariners 2-1 win over Cleveland…He recorded his 5th career multi-hit game (last: 3, 7/12 vs. LAA). He is batting .310 (9/29) with 9 runs scored, 1 double, 1 home run, 4 RBI, and 6 walks in last 9 G (since 7/8). • SEATTLE GENERALS:...there are currently (7) players on the Seattle Mariners active roster that were members of the 2012 Jackson Generals (INF Nick Franklin, INF Brad Miller C Jesus Sucre (15-day DL), C Mike Zunino and RHP Yoervis Medina, LHP Bobby LaFromboise, RHP Stephen Pryor (60-day DL). 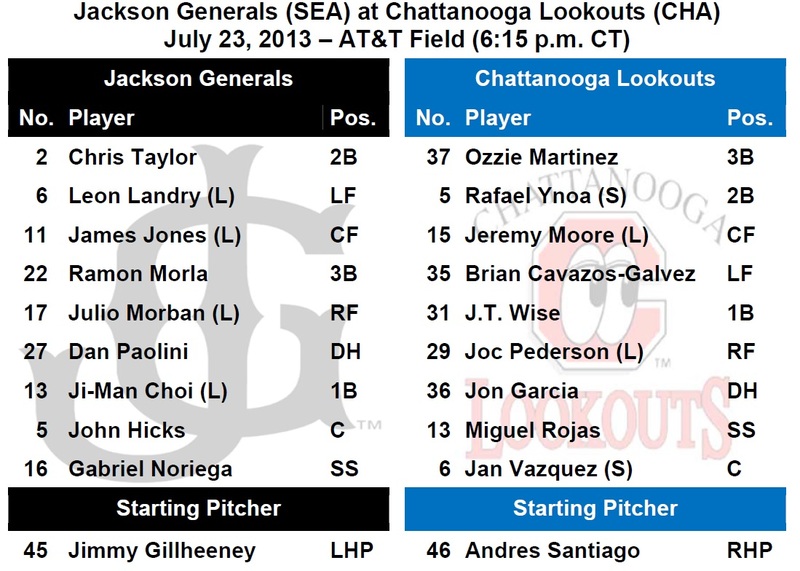 In total, (9) 2012 Generals have made their MLB debuts and (3) 2013 Generals. (C Brandon Bantz, RHP Hector Noesi, INF Brad Miller). • PAOLINI JOINS GENERALS: Former Siena College standout Dan Paolini was promoted from High Desert to Jackson today. Paolini leads the Mariners farm system in home runs (18) and RBIs (69) so far during the regular season. He was Seattle’s 10th round draft choice in 2011. • THE HOME STRETCH: The Generals begin the home stretch of the 2013 season tonight and will play 42 games in 42 days to close out the regular season. 27 of those games will come on the road and 15 will be at The Ballpark in Jackson. • WELCOME TO DOUBLE-A MR. LEONE: Generals reliever Dominic Leone is the 3rd member of the 2012 draft class to reach Double-A this season (Zunino, Taylor). The 21-year-old out of Clemson has tossed 3.0 hitless innings with 5 strikeouts in his first 2 Jackson outings. • TAYLOR ADDING UP THE HITS: SS Chris Taylor recorded his 100th hit of the season on June 30 vs. Birmingham. He was the first Mariners farmhand to record at least 100 hits. Taylor is batting .343 (24×70) with 12 runs scored, 4 doubles, 2 triples, 1 home run, 7 RBI, 11 walks and 4 stolen base in last 18 games. • LEADER OF THE GOON SQUAD: RH Tyler Burgoon has allowed only 1 run over his last 17.1 innings in relief (12 G). During this stretch he has limited opponents to a .115 average (6×52), while walking 8 and striking out 19. He has recorded at least 1 strikeout out in 22 of 25 appearances with Jackson (48 strikeouts overall), including 8 outings with at least 3 strikeouts. • ALL ABOUT THE JI-MAN: Quietly, 1B Ji-Man Choi is having one of the best seasons in the Mariners farm system. Overall this season in A+ and AA he is batting .295 (86×292) with 13 home runs and 58 RBI. He ranks 10th in AVG, 4th in HR’s and 4th in RBI in the organization. • WE GOTCHA! !...Jackson catchers lead the SL catching 53.2% of base stealers (50 CS, 94 Att). The next closest is Birmingham which is throwing out 35.8% of base runners.